Put down your guitar, pick up a game controller, and let’s dig in. Let’s face it: video games are a ton of fun. 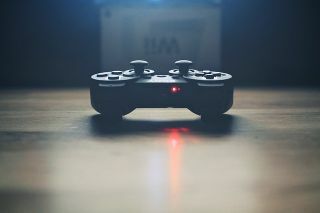 As much as we’d all like to spend our spare time playing guitar, it’s fun to switch things up, and video games are a great way to do just that. Luckily, there are plenty of guitar- and music-focused video games worth checking out, appealing to experienced players and non-musical folks alike. Here we run down a few of the best. So put down your guitar, pick up a game controller, and let’s dig in. Developed by leading game developer Ubisoft, Rocksmith claims to be the fastest way to learn guitar. With over three million users worldwide, the award-winning game — which dynamically adjusts to the users’ individual skills — features a song selection that includes cuts by The Police, Foo Fighters, Oasis and many more. Compatible with electric, acoustic guitar and bass, Rocksmith supports several different guitar types as well. 95% of users claim to have improved as guitar players, so it’s easy to see why this fun, enjoyable approach has become so popular. Find out more here. Sharing its name with Electric Six's hit 2002 song, Big Time Gaming’s Danger High Voltage is a slot game playable across multiple devices, with 4,096 ways to win. You might call it the perfect blend of fun, competition and guitar. The sound effects and music used in the game really help bring it to life, making players feel like they're right in the middle of a rock concert while playing. Find out more here. First released in 2005, the Guitar Hero series is likely the most successful guitar-based gaming series ever. There have been more than ten Guitar Hero titles released over the years, including band-centric releases, expansion packs and more. The games have become so popular that it’s inspired many to take up guitar playing in real life as well. While most Guitar Hero titles are worth a look, Guitar Hero III: Legends of Rock certainly sticks out as one of the best of the series. Find out more here. Rock Band, developed by the original team behind Guitar Hero, is a fantastic video game and one that every guitarist should check out. Multi-instrument play was introduced in this game, allowing players to try other instruments in addition to the guitar. Like Guitar Hero, Rock Band has inspired many to try their hand at playing an instrument in real life, too. It’s a fun game to play by yourself or with friends, and is a blast if you’re a guitarist. Find out more here.